On this page you can find information about what a QR Code actually is, how to generate it, how to read it, and what are the best programs for creating this two-dimensional code. A QR Code is a two-dimensional barcode (also called a 2D code) with a characteristic matrix, consisting of black squares arranged in a square grid on a white background. It is widely used around the world to efficiently store data that can be read by an imaging device such as a smartphone camera. The QR Code (Quick Response Code) is an evolution of standard barcodes due to its fast readability and greater storage capacity of 4,296 alphanumeric characters. QR Codes can be printed on posters, books, business sites, billboards. The image can contain messages, photos, links, data and information which can be accessed quickly. Among the many available websites and applications for the creation of QR Codes, we recommend the Online Labeljoy QR Code Generator tool , which allows to create vCards, links to web pages, Facebook, Twitter, Google Maps and much more. 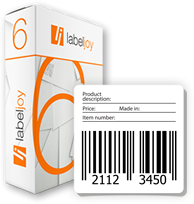 Alternatively, you can download Labeljoy, the most complete QR Code and Barcode software, to create QR Codes, QR Code labels, print and export barcodes in pdf, jpg and png, and all this OFFLINE. To read QR Codes, you only need a smartphone or tablet with an integrated camera. There are many free applications for QR Code scanners to install on your smartphone for reading and encoding QR Codes. Apart from the obvious graphical difference, the main difference between barcodes and QR Codes is the amount of information stored (20 vs 7,089 digits). A barcode can only store codes, while a QR Code can store links, data, text messages and images. QR Codes can be easily read by smartphones and are widely used in advertising on almost any object about which users might want information.